What will a quantum computer look like? It will probably not resemble your laptop. Yet, the semiconductor industry, residing at the heart of modern computing, has features that may carry over. Semiconductors are scalable: today’s processors (2.5 centimeters on a side) hold billions of transistors. Another benefit: semiconductor technology integrates with existing electronic and photonic elements. These practical considerations have led some researchers to construct semiconductor quantum devices. Then there are the distinctly quantum requirements that a quantum computer must have. These are clear, yet difficult to fulfill in a single system. One criterion is qubit initialization—this means that the user must have near perfect control to set a quantum bit in a particular state. A JQI-theory/TU Delft-experimental collaboration has recently published results that could be used to rapidly and reliably reset a qubit stored in a semiconductor double quantum dot. This technique has the added advantage that it offers a scalable alternative to current initialization methods. The quantum dots are fabricated between layers of gallium arsenide and aluminum gallium arsenide. At low temperatures, the electrons in this system move in a flatland, constrained to just two dimensions. The quantum dot provides further confinement, localizing these electrons in space. Scientists can apply electric fields to the quantum dot leads, allowing a single electron to leave the two-dimensional gas and effectively become trapped in a well. Quantum dots are analogous to atoms with their well-defined energy levels and electrons that can be manipulated with lasers and other electromagnetic fields. This is why quantum dots have been called “artificial atoms.” They also can be used as single-electron transistors. Just like an atom, quantum dot energy levels form a qubit. This platform can also be multiplexed to build double and triple quantum dots. In the results discussed here, a double quantum dot confines a single electron. Electric fields can be tuned to induce the electron to tunnel between the two dot potential wells. The spin degree of freedom is exploited to make a qubit. Here, the electron spin state changes from “spin-down” to “spin-up” when the electron tunnels between the two quantum dots. 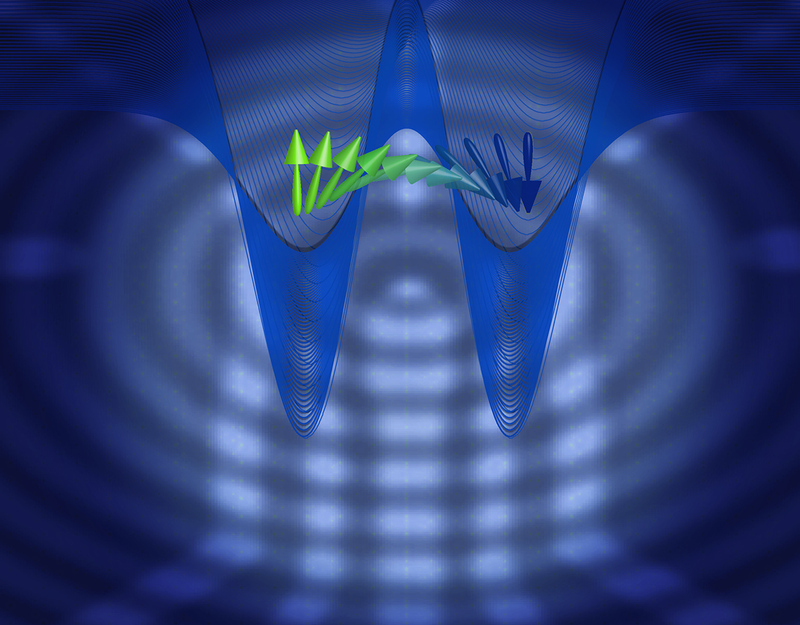 Even though the electron is trapped, alone, the qubit is not at all isolated. Quantum dots are islands in a sea of electrons, and thus are bathed in electromagnetic fields due to these charges. This gives rise to spin-orbit coupling. The surrounding crystal lattice also supports wave excitations called phonons. If the confined electron spin is oriented “down” or in an excited state, the spin-orbit coupling mechanism will cause the spin to relax into its “up” state and the released energy will produce an emitted phonon. Controlling this relaxation can be used to reset the spin in the ground state, at will. Nearly 15 years ago, UMD theorists Fabian and Das Sarma* predicted that this manipulation is possible due to special “hot spots” that occur in the GaAs system, where the relaxation is greatly enhanced. If scientists can characterize and observe these hot spots, then the relaxation can be harnessed as a reliable and rapid switch. 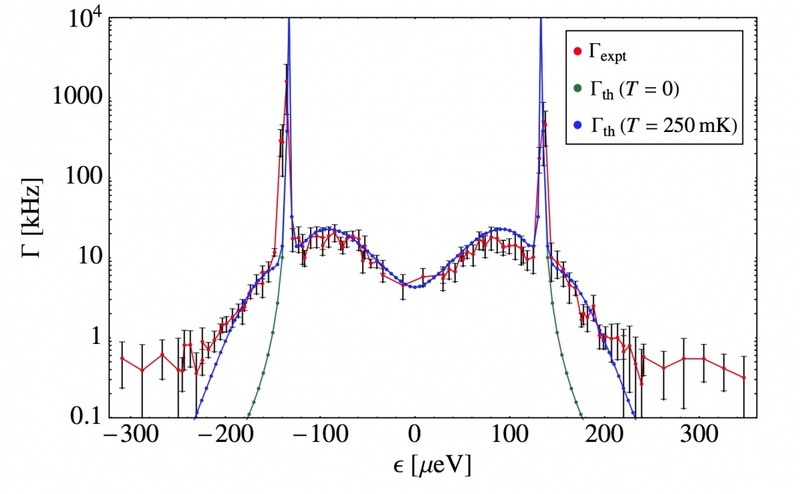 For the first time, as described in this research article, Delft experimentalists have verified the hot spots. The results are presented in the context of a novel theoretical approach. JQI’s Vanita Srinivasa (lead author and a postdoctoral researcher in Jake Taylor’s group) uses a mathematical model that predicts the location of the hot spots using the experimental parameters. The model, notable for its simplicity compared to other hot spot calculations, assumes a “two-state” picture and captures the essential physical features of the double quantum dot system. This toy model incorporates spin-orbit coupling using just the two lowest energy states– called “left” and “right” – to describe the position of the electron within the double dot as it tunnels. Despite this highly-simplified picture, which ignores all higher-energy [orbital] states, the model shows close agreement with the measured relaxation rate over a wide range of applied voltages. The model also predicts that raising the temperature above absolute zero will change the relaxation rate in regions where the electrode voltages are larger in magnitude than those at which the hot spots occur. Here, relaxation happens through an intermediate higher-energy state, and thus requires a phonon to be absorbed, rather than emitted. The agreement between the model and experiment highlights the important role spin-orbit coupling plays in the initialization method. This proposal has the added benefit that it offers a rapid and scalable alternative to current initialization methods. Currently, in order to initialize a qubit within a quantum dot, voltages are tuned to allow a single free electron to resonantly tunnel into a particular energy level in the quantum dot. Alternatively, one simply waits for an excited electron spin to relax into its ground state. The first method will become challenging when more qubits are added to the system, and both methods are typically slow. In contrast, the hot spots can be harnessed to drive one or many spin qubits into the ground state, for fast and robust initialization.